What can I say about the Olympia Blaze Hi-Viz Safety Vest that hasn't already been said about the wheel, penicillin, or the iPhone? It is kind of a big deal! The new Olympia Blaze Hi-Viz Safety Vest not only does its job, but it does it extremely well. 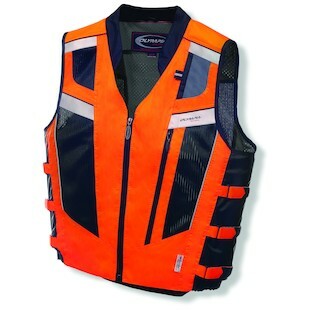 Many poorly designed hi-viz vests are fairly crude, bright-colored, pieces of fabric that go over your riding attire. 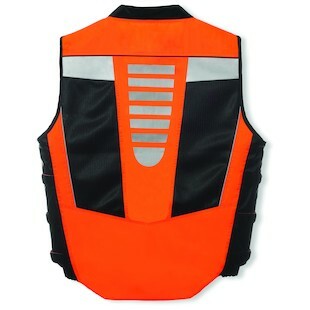 Rarely do any safety vests take exact fitment into account, allowing riders to make the vest snug in certain areas, while being relaxed in others. In replacing the ever popular Olympia Nova 2 Hi-Viz Safety Vest, the Blaze adds another adjustable waist/abdomen strap; allowing riders the ability customize the fitment of the vest, depending on their unique riding style/preference. The vest also meets many military high visibility requirements with multiple reflective bands from every angle, as well as a clutch-side clear I.D. pocket for quick military installation entrance requirements. This clear pocket can also come in handy for Motorcycle EZ-Pass storage while on trips which require highway usage. The biggest feature that makes the Blaze stand apart from other vests, however, is the new “self-packing” feature Olympia has strategically incorporated. The vest will easily fold back up into a concealed pouch that can easily fit in any tank / saddlebag, or under the seat of certain motorcycles. This added feature will allow you to easily remove the vest and store it away when arriving at your destination. From the versatility of easily storing the vest within its own carry pouch, to the 3 highly adjustable waist/abdomen straps, the Blaze vest can adapt to any riding scenario, making you noticeable to others motorists.